The IC-M73 has a stylish, ergonomic design. A durable and rugged body provides for user-friendly operation and long life. A wide viewing angle, high intensity LCD offers bright, easy to read characters. 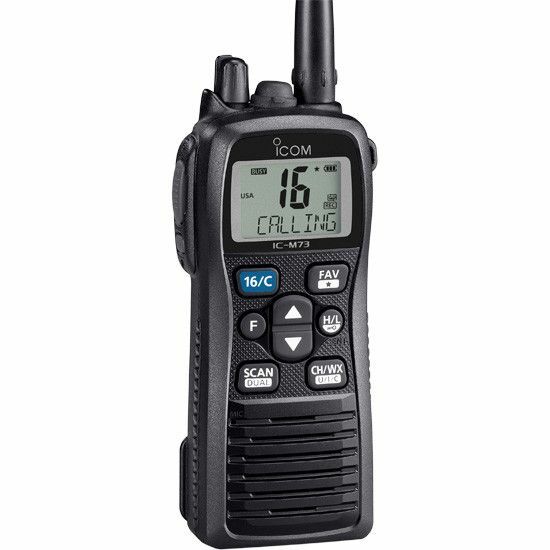 The IC-M73 continues to offer Icom’s best waterproof protection. The radio has been tested to survive after being submersed in 1.5m (4.9ft) depth of water for 30 minutes. 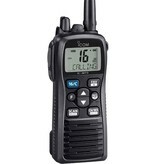 The IC-M73’s 6 Watts of transmit power will provide extended communication range for the user. A large capacity Lithium-Ion battery allows for 16 hours of operation, under normal conditions*. * Typical operation with 5:5:90 duty ratio. 18 hours for basic version.